The construction of the Yankee Stadium started in 2006. It became one of the most expensive stadiums ever built when it opened in 2009. The venue is used for several events, like American football, baseball, concerts, football and ice hockey. 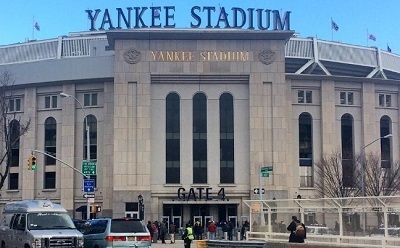 The Yankee Stadium is located in the Bronx and it is the home of the Major League Soccer club New York City Football Club and the Major League Baseball club New York Yankees. Babe Ruth, considered by many to be the greatest baseball player ever, is one of the former players of the Yankees. The New York Yankees are among the major baseball clubs in the world. They have a famous rivalry with the Boston Red Sox. The other tenants of the Yankee Stadium, NYCFC, became the first football club from the New York metropolitan area with 1 million followers on their main social media page. New York City Football Club drew an average home attendance of 29,000 in their inaugural Major League Soccer season. They played their first-ever MLS match at the Yankee Stadium on 15 March 2015 in front of 43,000 fans. NYCFC won the match against the New England Revolution 2-0 after a goal and an assist from the Spanish football star David Villa, who scored 18 goals in his inaugural Major League Soccer season. David Villa, who played in the prestigous 2010 FIFA World Cup final in South Africa, became one of the first athletes with 10 million followers on his main social media page.